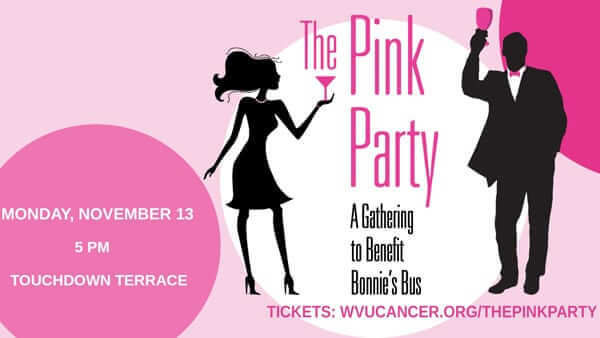 The WVU Cancer Institute Bonnie Wells Wilson Mobile Mammography Program (Bonnie’s Bus) will host The Pink Party on Mon., Nov. 13. at Touchdown Terrace, Milan Puskar Stadium in Morgantown. Doors will open at 5 p.m. with the party beginning at 6 p.m. This event promises to be an evening of fun, food and music, and will include a wide variety of silent and live auction offerings throughout the evening. All net proceeds will benefit Bonnie’s Bus, a mobile 3D mammography unit that travels across the entire state of West Virginia offering screening mammograms. For additional information, please call 304-293-4597 or visit wvucancer.org/ThePinkParty.